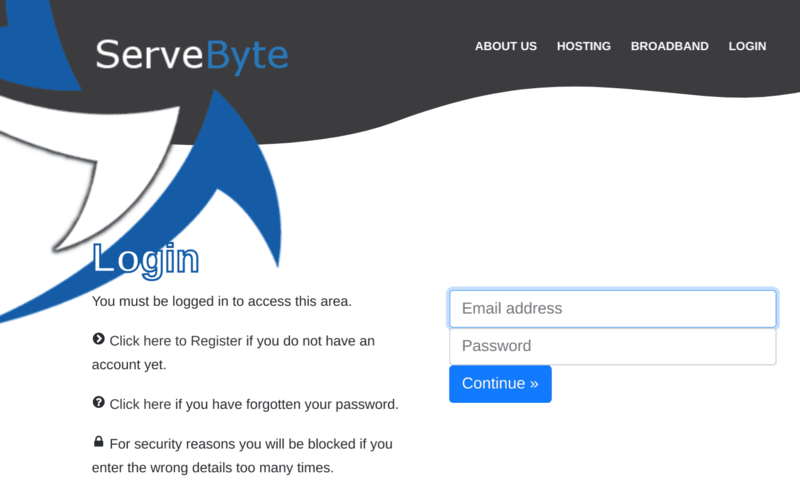 ServeByte Review 2019: Is ServeByte a Good Hosting? Irish hosting provider ServeByte was established in 2005, and it has data centers located in Dublin, Ireland. Among other services, this vendor offers shared hosting, VPS, dedicated servers, and VPN solutions. ServeByte is an Irish hosting provider that began its operations in 2005. This vendor offers a variety of hosting services including shared hosting, virtual private servers, and dedicated servers. Its solutions are ideal for small and medium-sized enterprises. ServeByte uses a fully redundant network architecture with no single points of failure, which ensures their clients’ websites and applications never experience downtime. They give you access to WHM cPanel which allows you to create your own cPanel accounts for the websites you operate. ServeByte’s website claims to offer a classic hosting uptime SLA of 100% and a cloud hosting uptime SLA of 10,000% (which must surely be a mistake). This vendor uses the Advanced Encryption Standard to ensure secure connections for their customers. They deploy VPS servers within minutes of receiving a customer’s hosting invoice, but their dedicated servers take a long time to load, sometimes as long as 36 hours (or more). 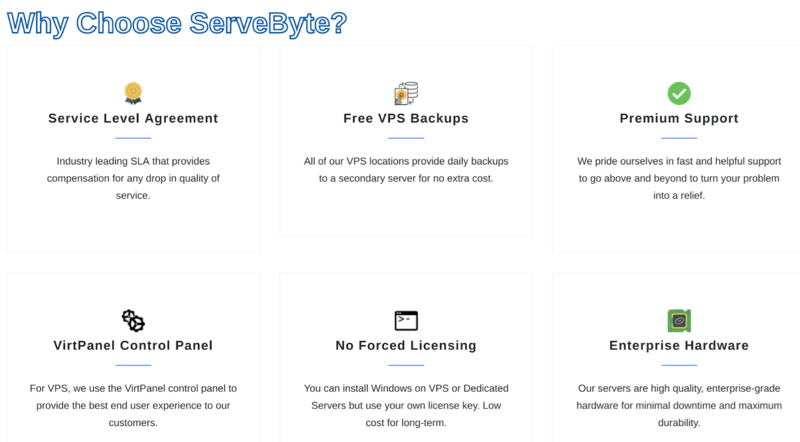 ServeByte does not offer backup solutions, and – according to their terms of service – they would never take responsibility for any loss of data that your website might experience, so customers have to organize their own website backups. This vendor offers no SSL certificates, whether free or paid. You can pay for ServeByte’s services on two billing cycles: monthly or annually. Their prices are reasonable, and they have made it easy to scale from one hosting plan to the next. They promise an uptime guarantee of 100% with an assurance that you will be compensated for downtime. It’s all the more surprising, then, that this vendor experiences considerable downtime occasionally, with some downtime events having lasted more than 24 hours. Also, some customers have reported as many as five instances of downtime in less than two months. With ServeByte, there is no money-back guarantee. As far as I can tell, Servebyte’s website provides no telephone number, email address, or live chat for prospective customers to enquire about its hosting solutions. The only way to contact the company appears to be by registering an account and logging in. This company’s claims to offering premium support are backed by existing customers who confirm that the support team is very skilled in all hosting issues. They are polite and professional in all their dealings with their customers, and their ticketing system has a very short waiting time; sometimes as short as just a minute. They promise no ticket escalation because each issue is assigned to a person with the skills and system access rights necessary to solve any issue entirely. Furthermore, you will receive accurate progress reports including the estimated time left to completion. This is all good because ServeByte’s online documentation leaves a lot to be desired in terms of helping you solve your own problems. For a hosting provider that claims to offer 100% uptime, it is quite disappointing to find out that they experience downtime quite often. These downtimes could be crucial for businesses with critical workloads. Unless or until these problems can be solved, I can only recommend their hosting solutions for personal blogs, startups, and small websites that can afford a few hours of downtime every few weeks. Wondering how ServeByte stacks up against other Web Hosting companies? Enter any other Web Hosting company and we will give you a side-by-side comparison.